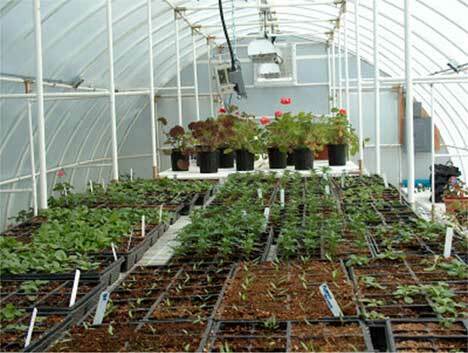 The newest greenhouse paneling material sets a new standard for durability, longevity, and ease of installation. Solexx Paneling is a sturdy twin-walled material made from an advanced formulation of polyethylene. Solexx Paneling is UV certified by an independent lab and is backed by an eight year warranty. The unique twin-walled design of Solexx Paneling makes it far stronger than film greenhouse glazing. 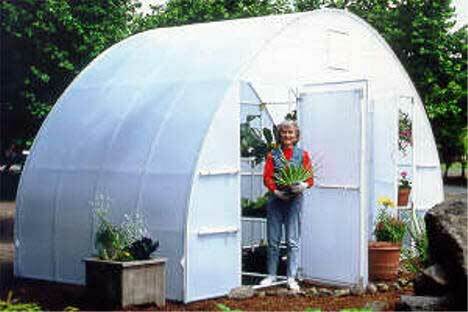 In addition, the air space between the two walls creates a protective insulation barrier that keeps greenhouses much warmer that single-wall pr polyethylene film coverings. Solexx Paneling combines the light diffusion of film with the strength of polycarbonate - at a price that is about one-half the cost of expensive greenhouse coverings. The flutes between the two layers of Solexx plastic thoroughly diffuse sunlight, creating ideal greenhouse growing conditions. Growers have reported that the resulting light is very evenly distributed, with little or no shadows created by various sized plants. Because sunlight is so evenly diffused by Solexx Paneling, solar burning is not a problem. Two different types of Solexx Paneling are available. Standard grade Solexx XP is 3.5 mm thick. Professional grade Solexx Pro, which provides additional strength and durability, is 5 mm thick. Solexx Paneling comes in a continuous roll that is 49.5 inches (4 feet, 1.5 inches) wide by up to 1,000 feet long, so it's easy to apply vertically or horizontally onto your structure. Overlap the panels or use the custom H-Channel connectors where the panels meet. Customers can order the precise length of paneling they need, virtually eliminating any waste. 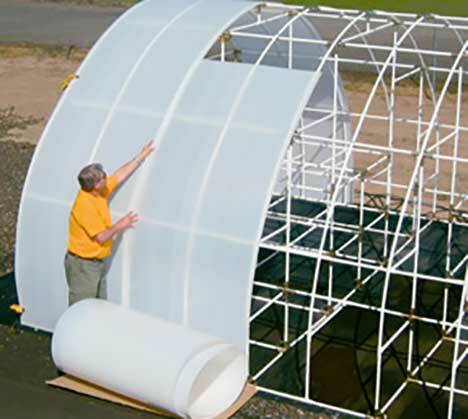 You can replace your old poly with the new Solexx Paneling, running the rolled twin-walled material up and over the entire greenhouse structure or running it the length of the greenhouse. Or use it for end walls and side walls. 5mm Solexx™ Panels: R-Factor 2.30 , U-Factor 0.43. 3.5mm Solexx™ Panels: R-Factor 2.10 , U-Factor 0.48. Note: R Factor - the measurement of ‘insulating ability’ of the material. The higher the R Factor number the greater the insulation value. U Value - the measurement of ‘heat loss’ through the material. The lower the U Value the less heat is escaping. *Independent testing, Solexx™ with caulked flutes. 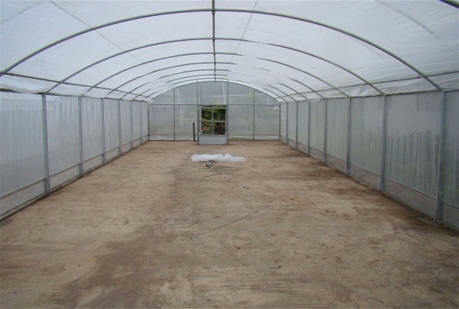 Solexx greenhouse covering surpasses other covering choices in insulation, light quality and longevity. 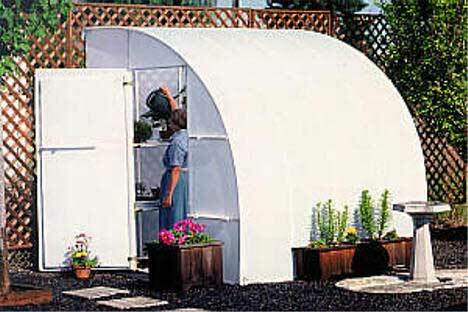 Save money year after year with healthier plants, lower energy bills and a greenhouse that lasts and lasts. Solexx is White For A Reason — it produces an even diffuse light proven to accelerate plant growth by 25%. The light glows evenly reaching into every corner of the greenhouse. More light for photosynthesis means more robust growth. Solexx offers a 10 year warranty with an even longer life expectancy. It withstands snow, wind, and hail and won’t fade or yellow over time. Best of all it requires very little maintenance. Should you need to replace the Solexx paneling at some time, the panels are readily available and easy to replace. Solexx provides superior insulation to hold in the warmth and keep your heating costs low. Plants thrive while customers save on energy costs. The chart below outlines the heating costs using different types of greenhouse coverings. Solexx has one of the highest R factors of 2.1R on the market, so it holds in the heat better than the competition saving you hundreds or thousands of dollars over other greenhouse coverings. 1. UNROLLING: If the precut panel or length off of the roll is too curved for easy installation, try straightening it out by laying it out flat in a warm environment. Also, if the roll/panel has been in storage for a period of time, it may have developed a slight "yellow" tint from the UV inhibitor. Exposure to direct sunlight should quickly clear this up. 4. SPACING: We recommend that the framing (trusses) that will support your Solexx be placed 16" - 24" on center. 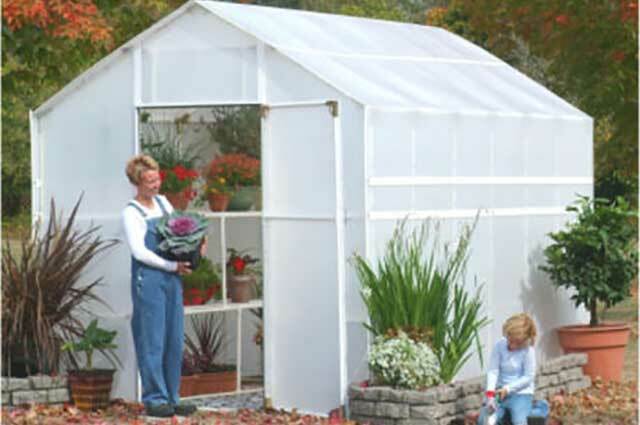 If applying to a greenhouse frame with 4' or 6' centers, cross bracing is recommended to prevent sagging between the bows. Ask us about cabling over the bows to prevent expansion sagging. 5. INSTALLING: Solexx paneling can be applied with the flutes running in either direction on your structure. Applying your Solexx paneling so that the flutes run perpendicular to the framing adds to the strength of your structure but it can also be applied in the same direction as the framing. If you are covering a plastic or a wood structure, attach with our 1" screws with neoprene washers to prevent water from getting into the flutes. Our ¾" self-tapping screws are for installing your Solexx paneling onto metal framing. Either way, no pre-drilling of the paneling is needed. We suggest placing the screws about 6" apart on the stringers where it is overlapped or on the perimeter of the wall or roof structure. Be careful not to over-torque the screws, or you may crush the paneling. The washers should just slightly dimple the panel. 6. CUTTING: Except where your panel ends at ground level, it is helpful to attach the panel to your structure first, and then use a sharp, thin utility knife to follow the frame as a cutting guide. It works well to cut the panel with two passes of the knife. On the first pass, use light pressure to score the panel and set the path the knife will follow for the second pass. The second pass should be done with more pressure to cut through the panel, while making sure the knife is following the score line of the first pass. 7. U-TRIM: is installed on the open flutes to help keep out bugs and moisture and to maximize insulation7. U-TRIM: Caulking the ends of the flutes as described above will also prevent insects and moisture from intruding into the flutes. For cosmetic enhancement you may then slide a U-trim piece over the end of the panel for a permanent cap. Secure U-trim with small screws by poking a small starter hole in one side of it with an ice pick or small nail. Then insert screw through one side of the U-trim into the Solexx paneling. Place each screw approx. one foot apart. Put caulking in all the holes you created to stop water penetration. Normally the screws are installed from the under side of the panel or the side facing the center of the structure you are paneling.